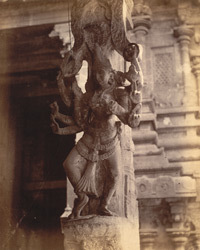 Photograph of a close view of a pillar from the Pudu Mandapa at the Minakshi Sundareshvara Temple in Madurai from the Archaeological Survey of India Collections, taken by Nicholas and company in c.1882. The great complex of the Minakshi Sundareshvara Temple dedicated to the goddess Minakshi, consort of Shiva, is contained within a vast enclosure entered through tall gopuras or towers extremely elaborate and completely covered with figures of divinities, celestial beings, monster masks and animals encrusted in plaster decoration painted in vivid colours. The Pudu Mandapa is situated in front of the east gopura and consists of a long hall with piers carved with yalis and portrait sculptures of the Nayaka rulers.